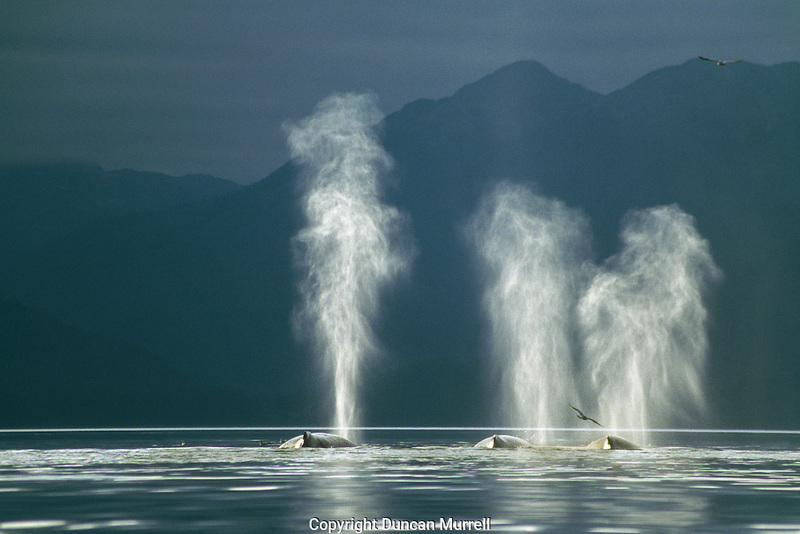 The lighting for photographing humpback whales in Southeast Alaska is unique, with a backdrop of snowy peaksmountains and forest-clad mountains frequently cloaked in wisps of ethereal mist, the rainbows There was commonly extensive cloud cover but any chinks of light that were able to break through the gloom seemed to highlight the outline of the whales and illuminate their plumes of transitory breath. The effect was even more pronounced when they were set against a backdrop of dark, forested mountains. This photo was Highly Commended in the Endangered Species category of the BBC Wildlife Photographer Competition in 2002, the same year that I won the Mammal Behavior category with a photo of a lunge-feeding whale, also taken in Tenakee Inlet.